Specially invited guests, dignitaries and members of the media joined us on Thursday 29th June 2017 to celebrate The Ronnie Richards Memorial Charity activating their 200th Public Access Defibrillator (PAD) in the South West at Humphry Davy School, Penzance. Humphry Davy School has worked closely with the RRMC over the past few years; training all staff and students to confidently use lifesaving equipment and helping to raise funds. 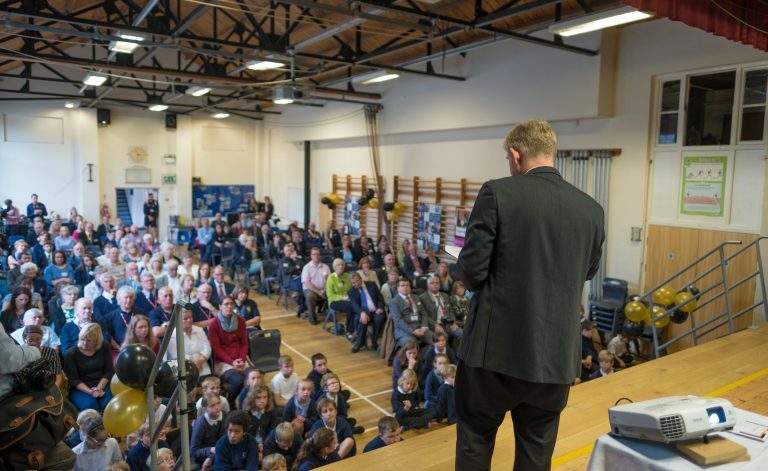 The school is honoured to receive the 200th PAD and the event was fittingly spectacular to mark such an outstanding achievement by a local charity and community groups. Sudden Cardiac Arrest (SCA) kills 2,000 people weekly in the UK, and as many as 270 of these will be children in our schools. The heartbeat stops abruptly and is usually caused by ventricular fibrillation (VF), an abnormality in the heart’s electrical system. When this happens, blood stops flowing to the brain, the heart and the rest of the body, and the person collapses. A quick combination of CPR and defibrillation can restore life. BBC Spotlight Television speaking to Humphry Davy School pupils about the importance of CPR & AED training in schools. The RRMC are currently the only organisation in the UK that has embraced a full PAD programme covering public communities, residential areas, schools, sports venues and beaches. The RRMC works very closely with all major emergency agencies, including South Western Ambulance Service Trust (SWAST), hospitals, the Fire Brigade, National Coastwatch Institution, Police, Surf Life Saving Great Britain, and GPs, to ensure the best possible infrastructure is in place. The Ambulance Trust has all South West PAD sites on their system. The operator will direct 999 callers in a cardiac attack situation to a nearby PAD site and guide throughout. SWAST has all RRMC PAD sites on their operations system. The ambulance call handler will direct 999 callers in the event of a heart attack or cardiac arrest casualty to a nearby PAD if available. If not available, CPR will be prompted until emergency services arrives. For external locked keypad cabinets, they will give the access code. In both scenarios the ambulance call handler will remain on the line and guide throughout. It has been known where pads have been applied to a male casualty conscious having a heart attack! The work of the RRMC and schools like Humphry Davy has saved lives and will ensure that future generations know exactly what to do in an emergency. 200 PADs in the South West alone are an incredible achievement. The event was led by Humphry Davy School’s Headteacher, Bill Marshall, and Ronnie Richards Memorial Charity founders Paul and Liz Williams. Special awards to celebrate and recognise the hard work of individuals and organisations were made and there was the opportunity to network and for the press to talk to guests during a buffet reception that followed. Thank you to everyone who attended; we’re sure it won’t be long until we celebrate 500! Copyright 2018 Ronnie Richards Memorial Charity.